Few Souls players are more talented than Lobos Jr—he once beat the game upside down! Like many Souls enthusiasts, he’s digging through the Bloodborne DLC, The Old Hunters. Just recently, he pulled off something incredible: beating the crazy hard first boss on New Game+++++++ (that’s 7!) with only his fists. Ludwig is the first monstrosity you tackle in The Old Hunters. Having finished the DLC—there’s a review coming eventually, promise—he remains the toughest fight. 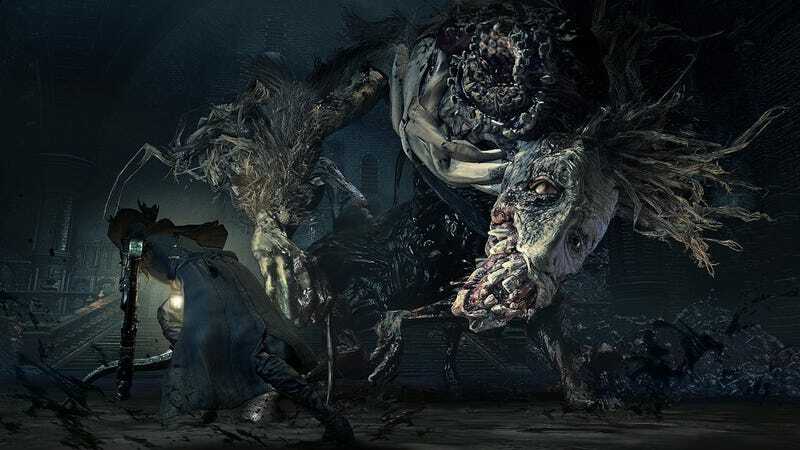 For my money, Ludwig might be the hardest boss in all of Bloodborne. When you beat Bloodborne, it’s possible to start over with the same character in New Game Plus mode. Nothing about the story or enemy layout changes in New Game Plus, but enemies dish out more damage and have more health, providing an extra layer of challenge to an already difficult game. You can stack New Game Plus over and over, capping at New Game+++++++, aka New Game Plus 7. That’s what Lobos Jr has been doing on his latest Bloodborne run, but to make things even more difficult, he’s using only fists to take down enemies. That means he’s dishing out pitiful amounts of damage per attempt, forcing him to dodge and weave for long periods of time, hoping to chip away over and over. It’s actually demoralizing to watch how little damage he’s able to do. Even the winning fight wasn’t without an enormous amount of tension. Ideally, it only takes a few minutes to defeat Ludwig, but Lobos Jr has to wait for the precise moment to move in and take his shot. That requires an extraordinary amount of patience, transforming into a battle lasting more than 30 minutes. The first half of the fight actually goes really well for Lobos Jr, easily sending Ludwig into his more annoying second form with 20 blood vials left. (You can typically only carry 20, but he’s equipped items that allow him to hold 27.) But some unfamiliarity with Ludwig’s later attacks forces Lobos Jr into a do-or-die situation. In the closing minutes, he’s running around with just one vial left. My heart is still pounding, and I didn’t even watch this happen live! Lobos Jr has since gone on to defeat everything but the final boss in the DLC.